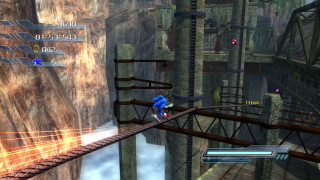 Radical Train is a stage in Sonic the Hedgehog (2006) for the Xbox 360 and PlayStation 3. As with other levels in the game, it features in all three of Sonic, Shadow, and Silver's stories, and although the characters fight their way through the area for different reasons, they do venture the area at the same time, unlike other stages in the game. Accessed from the Soleanna New City terminal, Radical Train (predictably) follows the railway tracks through the countryside. Whoever designed Soleanna's railway system seems to have had a peculiar (and dangerous) liking for bottomless gorges and rickety-looking bridges constructed thereupon. As well as running along the tracks into the path of oncoming freight trains, the hedgehogs must also clamber across rather carelessly abandoned construction frameworks, including conveyor belts and giant, scale-like crane loads. The cables above the train tracks can function as convenient grindrails if you can get up high enough. Mission: Follow Dr. Eggman's Train! Team Sonic complete their escape from Flame Core by tumbling out of the temporal vortex into Soleanna New City. Only Tails seems in the least bit concerned at the loss of Shadow and Rouge. Inquiries to the townsfolk reveal that Elise (having escaped White Acropolis with Amy's help during Silver's story, only to be re-captured by Eggman mere cutscenes later) is being transported by train away from the city. Sonic must acquire the capability to perform a Bound Attack in order to sneak under the police roadblock and give chase from the terminal station. Deviously, Robotnik has rigged various trains to plough into exploding barricades, and Sonic has to pre-detonate the explosives before the carriges collide. Hastily beating up Egg Gunners to access switch cases is therefore the order of business. Only once all the barricades are down does Sonic conclude that Elise was actually on a different train - thus leading to a mach speed section where the hedgehog chases the final locomotive down. If the train hits the bombs, Sonic will lose a life. Shadow's (slightly later) return from Flame Core likewise deposits him and Omega on the pavements of the New City. They meet up with Rouge, who (during their absence) has discovered that Eggman's robots are looking for the Ultimate Lifeform - although Shadow explains that their target is probably Mephiles. Unsure why Robotnik would be after the malicious demigod, Shadow decides to track the fat man down and ask him for answers directly. While Sonic's mission was to protect the passenger trains from Robotnik's exploding barricades, Shadow has to do the opposite on the Doctor's own vehicle. Here flicking the switches raises laser barriers across the track, forcing Ivo to halt his progress until they deactivate. During these stops, Shadow deals as much damage as possible to the front carriage. Replacing Sonic's mach speed section is a motorbike chase for Shadow, who (rather than just catching up to the train) must machine-gun it until it grinds to a halt. In the subsequent cutscene, Shadow busts through the roof of the Doctor's train car, to which Robotnik nonchalantly enquires "Wouldn't the door have been easier?". Not exactly co-operating with Shadow's questioning, Eggman instead instructs the hedgehog to bring Mephiles to him upon capture; then he'll divulge the secret of the Solaris Project. Their fact-finding trip to White Acropolis yielding more Chaos Emeralds than answers, Silver and Blaze return to Soleanna New City only to stumble across Mephiles in the middle of the plaza. Absently dismissing Silver's queries about the agenda of the Iblis Trigger, the demigod instead directs them to the terminal station, where said Trigger is in the process of rescuing Elise. Silver's Radical Train does not involve chasing down rail cars, but simply getting from one end of the area to the other. Psychokinetic gimmickry is used to its full extent here, with Silver being required to position crates on the crane-scales in order to shft their heights and proceed. Eggman's robots remain out in force along the tracks' rusting infrastructure. The futuristic hedgehog eventually does find Sonic (plus a just-re-rescued Elise) at the end of the level; however, Shadow jumps in to intervene before Silver can finish the Iblis Trigger off, leading to a fight between the two.